Who Needs the FileHelper Library ? History and Last Changes !! The FileHelpers are an easy to use library to import/export data from fixed length or delimited flat files (like the CSV). 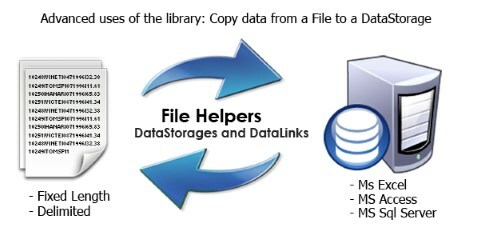 FileHelpers also has support to import/export data from different data storages (Excel, Acces, SqlServer). The library has a set of converters for the basic types and can be easily extended to provide custom converters. You can strong type your flat file (fixed or delimited) simply describing a class that maps to each record of the file and work with your file like a strong typed .NET array. To start using the FileHelpers Library you only need to add a reference in your project to the file: FileHelpers.dll. You can find it in the Release directory of the distribution. Tip: remember to leave the FileHelpers.xml file to get Intellisense support. Working with FixedLength files is exactly the same but you need to use the [FixedLengthRecord] and [FieldFixedLength] attributes. Who needs the File Helpers Library? In almost every project there is a need to read/write data from/to a flat file of a specified format. Writing the code to process these files is not hard, you can use String.Split or String.SubString, but if you do that the code sometimes becomes hard to read and change. If you want to add support later for quoted string, multiline, convert types, etc. these things tend to get complicated. So with the FileHelpers you don't need to worry about changes in the file structure because you can change the Type, Converters, Triming, Length in seconds. 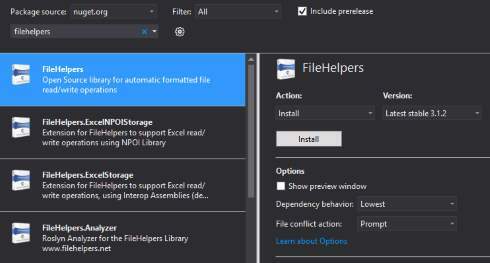 Another place where you can find the FileHelpers useful is for log parsing, data warehouse and OLAP applications, communication between systems, file format transformations (for example from a fixed length to an CSV file), load test data into your NUnit tests and a lot more!!! This library aims to provide an easy and reliable way to accomplish all these tasks. 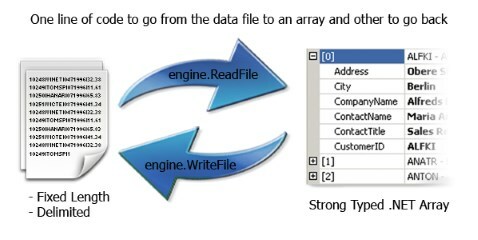 Our Roslyn Analyzer helps you to use the library in the right way. Since version 1.3.5 the library has had a Record Class Wizard to generate the record class. The Record Class Wizard allows you to generate your record mapping class, save the definition, generate code based on snippets (Read File, Read with Generics, ReadAsync and so on). The FileHelpers library is straightforward to learn and use. The library has a set of converters for common types and can be easy extended to provide custom converters. .NET 2.0, 3.0, 4.0, 4.5, 4.6 and Mono!! You can configure the library to use different ErrorModes. You can use the library to read line by line and not the whole file. Here is a screenshot of the progress notification of the demo app. Since versión 1.4.0 you can get notified of the progress of each operation of the library to show feedback to the user or whatever you want. Arg1: A string with the DateTime format that the engine passes to the DateTime.Parse function. // By default the engines use: "ddMMyyyy"
[FieldConverter(ConverterKind.Date, "dd/MMMM/yyyy", "en" )] // or "en-US"
Arg1: A string with the character to be used as DecimalSeparator. Valid Values: "." or ",". By default: "." // "," is the decimal separator. By default, this converter takes the strings "True" (case insensitive) and "1" as true. The values "True" and "False" are returned when converting the field to string. // By default it reads as true the strings "True" (Case insensitive) and "1"
// Takes as true the string "1" and as false the string "0"
// You need these params if you want to write, because it use "True" and "False"
// Takes as true the string "X" and as false the string "-"
The FileHelpers has reached a big Milestone today we are releasing the 3.1 version! Now with full support for .NET 4.0, 4.5 and Mono and with a ton of news and enhancements. NEW: Full .NET 2.0, 4.0 & 4.5 support. NEW: Added support for MONO !! NEW: FieldOrder: a new attribute to override the default order of fields. NEW: Async Methods returns IDisposable to allow using() statements that autoclose files on ends or exception. NEW: Events for the Async engines. NEW: The events args now have TotalBytes and CurrentBytes to allow you show progress while reading or writing. MOD: The error messages have been made more meaningful. In all exceptions you get: FieldName, ColumnNumber, LineNumber etc. NEW: FieldNotEmpty: Indicates whether the target field needs to be populated with a non-empty value. The core code of the library was refactored to make easier to extend it. More documentation has been added to the Library source code. It is now even easier to get involved in development! FileHelpers Library is @Copyright 2005-2015 to Marcos Meli but it's source code and the binaries are free for commercial and non commercial use. Vote for this article if you like the library. Marcos Meli v1.0 was released at august of 1980 by Francisco and Mabel Inc.
He´s from Bahia Blanca, Argentina. He enjoy developing from the 12 years, has a degree in Computer Science, and of course, love this site and .NET in general. He is the lead developer of the FileHelpers Library. Marcos is also the co-funder of Devoo.Net. Handling CSV files that have unknown fields? Hello, I have been looking for a CSV parsing solution - and this looks impressive. However, unlike many others here I have to work on a generic solution. I do not know what types of CSV files my users will be importing into my app (and then being stored in a DataTable). So - creating classes before hand will not work. 1. I need to generate the classes at RunTime. This would then allow me to have the user select the fields and their types. 2. I will need to generate a DataTable from the imported data, with the correct data types, rather than just string fields (that a lot of other libraries do). 1. Your WebDemo of the Wizard does not seem to be finished. You note that you have a Wizard on feature list. Do you have a sample of how to use it? I am wondering if it might help me with getting the user to tell me what type of fields each column should be? lot of great work from you! I want to write a big file, apron 500 MB and in the last line I don't want to have a break line. How can I do this please? Hello - thank you for your useful library. In my context, this is happening because the csv file is produced by a spreadsheet component (DevExpress) and blank rows in Excel come out as just a row of commas. I am using V3.1.5 of the FileHelpers DLL. In my case, I woudl be happy to have these rows skipped or ignored, but a better solution would be to create a blank row in the DataTable, with maybe an option to ignore blank rows. Hello, thanks for your work on creating this great library. I am trying to use the SmartFormatDetector to determine the data types in the columns of a csv. For example if the first column only contains integers then I would expect a data type of System.Int32, likewise for columns with dates, I would like to know that the column contains dates and if possible what the date format is. However, when I run the SmartFormatDetector, it always detects all columns as System.String. Am I misunderstanding the purpose of this function? Is there a way to do the detection as I described above. Currently the implementation of SmartFormatDetector is to discover if a file is fixed length or delimited and discovery different fields in fixed length and the delimiter in delimited files. Also tries to detect if a field can be quoted. The home page example [^] is really great for delimited files. But I can't see any similar examples for Excel? Links to previous examples have disappeared. Can you provide a similar example for Excel? How does performance comapare against other libraries? Have you tested this against other libraries like Lumenworks.Framework.IO? That is what I currently use because it's the fastest CSV reader i've found so far. I've got several CSV files I have to read every 30 minutes with anywhere from 1000 rows to 500,000 rows. I need to read them as fast as I can. Re: How does performance comapare against other libraries? The performance is pretty fast because it uses dynamic code generation, only the first read of each record type can take a bit, but the read after that will be limited by IO never by CPU. It was free in github now lauched as commercial product? it would be perfect if you support SQLite. could you give me some hint to take simple way? I plan to test your file helper in next month for my project and I have not spent much time on SQLite yet, but I plan to use SQLite to save my data. This is, without doubt, the most used 3rd party library in my toolbox, and I delighted to see a new release. tengo una inquietud y espero me puedan dar alguna idea sobre el tema. Debo leer archivos panos de mas de 5gb pero estoy tratando de encontrar la manera mas optima de hacerlo. no sé si con esta herramienta es posible trabajar con este tipo de archivos tan grades o si alguno de ustedes sabe alguna técnica o de algún componente, se los agradezco.. I need to insert the records in my CSV file to a table in my database through c# and asp.net ( i work with sql server 2014), I have no idea how to do it using FileHelpers .. Help me ! You mentioned mysql in "about article". How can I implement that ??? I'm also interested in MYSql support? Has anyone implemented this yet?